Over the last couple of weeks I have been able to visit and taste the wines of Prince Edward County, the Finger Lakes and, of course, Niagara. It’s exciting to watch this triangle of wine regions, all within driving distance for wine lovers in Southern Ontario, come of age and get better and better at defining what they do best from the soil and microclimate that nature gave them. I am also fortunate to receive wine from a few Okanagan wineries, another region that I consider local even though it’s four provinces away, and a few wines trickle in from Pelee Island, Lake Erie North Shore and the new South Coast region in Norfolk County. In two weeks, I will be back in the Okanagan Valley to taste hundreds of Canadian VQA wines as a judge for the Wine Access Canadian Wine Awards. While I look forward to the judging, I also can’t wait to try new wines from that magnificent region. In the meantime, here are some reviews for a few Canadian wines (non-Niagara) that I have tried and enjoyed in the last little while (reports on both Prince Edward County, beyond the Rosehall Run reviews below, and Finger Lakes, to follow in separate posts). One of the landmark wineries in the Okanagan Valley is Tinhorn Creek, located on a hillside overlooking estate vineyards, sagebrush, and the old gold mining creek that is its namesake. Tinhorn sources fruit exclusively from its own vineyards: 150 acres of prime land on two very distinct benches — the 100-acre Diamondback Vineyard on the Black Sage Bench and the 50-acre Tinhorn Creek Vineyard on the Golden Mile Bench. It makes two tiers of wines, the single vineyard series featuring Gewurztraminer, Pinot Gris, Chardonnay, Cabernet Franc, Pinot Noir and Merlot, and winemaker Sandra Oldfield’s signature wines made each year when quality dictates what should be made at the top tier. Here’s what I liked from the release earlier this summer. 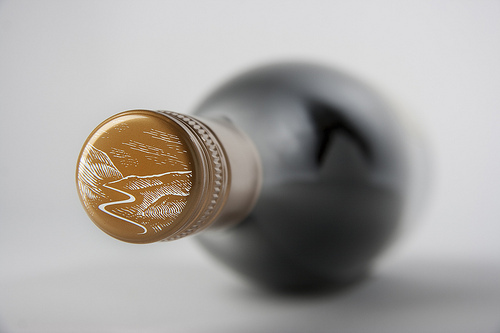 Tinhorn Creek Oldfield Collection Pinot Noir 2008 ($30, 91 points) — This is the first vintage for Pinot Noir in winemaker Sandra Oldfield’s top tier collection. The wine spent one year in French oak barrels, followed by three years in bottle and has limited availability at the winery or online. What a gorgeous Pinot. The nose shows bramble, cherry-vanilla, raspberry bush, lavender, rosehips and pomegranate. It’s textured and layered on the palate with cherry-kirsch and anise flavours bolstered by oak and warm spices. It has length through the finished and is balanced nicely by racy acidity. 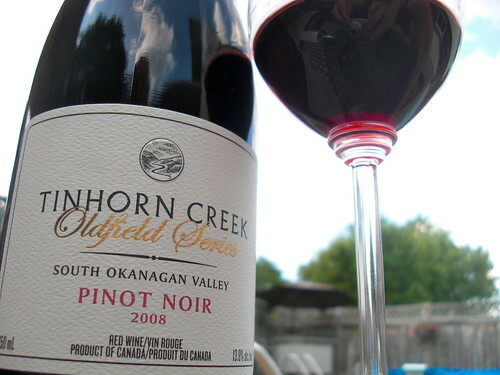 Tinhorn Creek Pinot Noir 2009 ($20, 88 points) — This is a dark and savoury effort from Oldfield with earthy cherry, cedar smoke and meaty notes on the nose. It shows some raspberry and cherry on the palate with notes of beetroot, licorice and anise that’s lifted by firm acidity. It opens up in the glass to reveal richer fruit flavours. 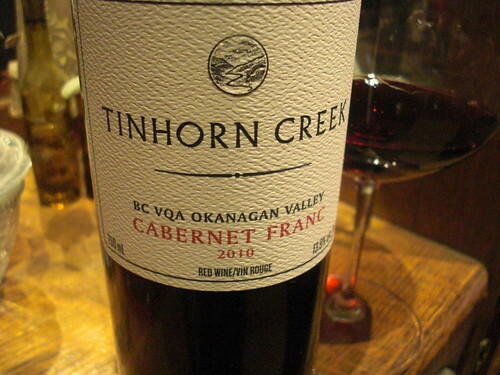 Tinhorn Creek Cabernet Franc 2010 ($20, 89 points) — This is the signature grape from Oldfield and fans of Tinhorn know it, snapping up the entire production quickly vintage to vintage. The 2010 vintage is classic Cab Franc with raspberry-bramble bush aromas followed by currants, soft spice, tobacco and licorice. It’s simply delicious on the palate with raspberries and dark fruits, earth, cedar, smoke, herbs and gritty tannins that all lead to a long finish. Tinhorn Creek Chardonnay 2011 ($18, 87 points) — A restrained nose of green apple, citrus and hints of creamy vanilla, though not in an oaky way. It is bone dry and austere on the palate with apple-lemon flavours, a touch of minerality and loaded with racy acidity. 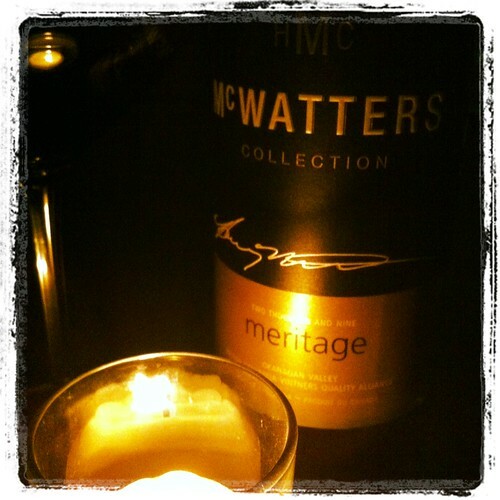 McWatters Collection Meritage 2009 ($30, 90 points) — Harry McWatters continues to impress with his latest Meritage made from Cabernet Sauvignon, Merlot and Cabernet Franc sourced from the Sundial Vineyard on the famed Black Sage Bench in the southern Okanagan Valley. The nose shows ripe notes of currants, cassis, blueberry, mocha, raspberry jam, and toasted spices. It’s more elegant than overpowering in the mouth, with red berries, some currants, roasted Espresso bean, vanilla and a touch of herbs and licorice through the finish. It shows good balance and verve from a racy vein of acidity. Smoke & Gamble is based on a premium vineyard estate located in Norfolk Ontario. Founded in 2006 on what was originally an equestrian retreat, Smoke & Gamble is both a grower and producer of wines using cool climate practices along with selective application of the appassimento process. Smoke & Gamble White 2010 ($18, 87 points) — This Norfolk County producer adds just over 13% Chardonnay Musque to this mostly Chardonnay white. It has a lovely nose of lemon spritz, peach, melon, lifted floral notes and soft vanilla. It’s clean and fresh on the palate with lovely fruits balanced by decent acidity. A very nice summer wine. 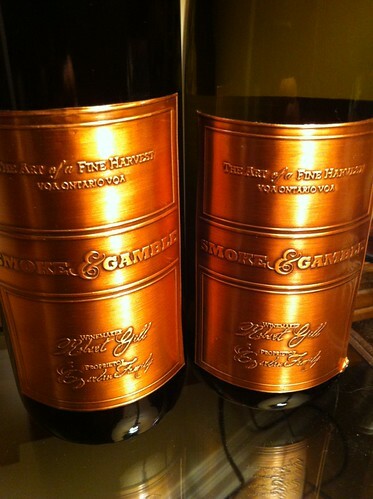 Smoke & Gamble Red 2010 ($20, 88 points) — A blend of 49.5% Merlot, 37.2% Cabernet Franc, and 13.3% Cabernet Sauvignon. This shows the richness of the hot 2010 vintage with an expressive nose of blackberry, cherry, raspberry, cassis and spice with touches of smoke and licorice. It’s juicy and ripe in the mouth with integrated fruit flavours and smoky-spicy undertones. Frisky Beaver Frisky White Dam 1 2010 ($14, 86 points) — From Dover Vineyards in Port Dover, Ontario, this white is a blend of 77.8% Chardonnay, 12.2% Chardonnay Musque, 5% each of Gewurztraminer and Sauvignon Blanc. The nose shows melon, pear, lychee nut, apple, clove and grapefruit. The fruits are ripe and fleshy on the palate, with some decent acidity. Good summer sipper. Pelee Island is Canada’s warmest and southernmost appellation. The Pelee Island Winery crafts a number of affordable wines under different labels. 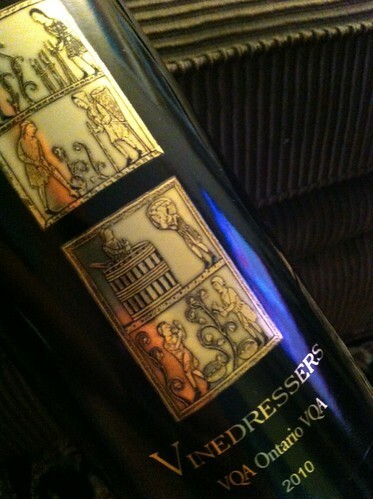 The Vinedressers series is part of the premium line. Pelee Island Vinedressers White 2011 ($18, winery, Vintages fall release, 87 points) — A blend of 68% Sauvignon Blanc, 27% Viognier and 5% Chardonnay. Everyone seems to be making these white blends in Ontario to various degrees of success. This is one of the better examples with a nose of pretty peach, white flowers, citrus and tangerine. It’s fresh and fruity on the palate, slightly viscous, with bold citrus and passion fruit flavours in a relatively dry style. Pelee Island Vinedressers Red 2010 ($18, winery, Vintages fall release, 88 points) — A blend of 30% Merlot, 30% Cabernet Franc, 20% Lemberger and 20% Cabernet Sauvignon. A very well done blend and bravo for tossing some of that personable Lemberger into the mix. The nose shows cassis, blueberry, licorice-anise, hickory smoke, black cherry and cocoa. It’s rich and layered on the palate with lovely and balanced black and red fruits, spice and plush tannins. This forward-thinking PEC winery has built its reputation on the staples of the County — Pinot Noir and Chardonnay — and rounded it out with a Cabernet Franc, that gets better and better with each passing vintage, and some other chosen treats like its $15 Sullyzwicker (now called SZ) White and Red wines. And now you can add the premium Defiant Pinot Noir and Liberated Chardonnay wines to the list of new wines from the estate. The Hillier, Ontario, winery is owned by Dan and Lynn Sullivan. Dan makes the wine and Lynn keeps everything under control on the business side. The estate Rosehall Vineyard was planted in 2001 and the first harvest was in 2004. The wine is made in a gorgeous 7,200-square-foot winery and barrel cellar, which was completed in 2008. Hillier is one of the driest areas of Ontario with a moderating easterly breeze from Lake Ontario. Rosehall Run Liberated Chardonnay 2011 ($16, LCBO fall release, 88 points) — Sullivan sourced his grapes for this unoaked Chard from the Beamsville Bench in Niagara and his own estate grapes. This is a pure, fruit-driven wine with highly aromatic peach, apple and pineapple notes. It’s delicious on the palate with bright, clean peach cobbler and apple flavours in a clean, crisp style. 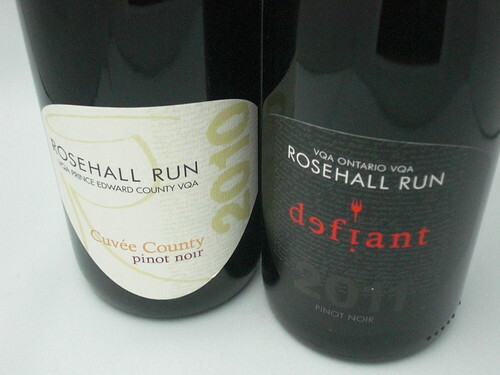 Rosehall Run Defiant Pinot Noir 2011 ($19, LCBO fall release, 89 points) — This is made entirely from Prince Edward County fruit, with a touch of French oak aging and made with only 12.5% alcohol. It shows cherry lollypop, raspberry and sweet spices on the nose in a style that doesn’t shout at you. It’s very pure on the palate with medium weight, cran-cherry flavours, and lightly toasted spices in a highly quaffable style. The kind of Pinot you while away the hours with on the back porch with friends. Rosehall Run Cuvee County Pinot Gris 2011 ($22, winery now, LCBO TBA, 89 points) — The County isn’t noted for its Gris, but the profound minerality does add a quality to the wine that gives it an added dimension not found elsewhere. Sullivan sources the fruit entirely from Hillier and makes this wine without the use of oak. The nose shows slate minerality, pear and citrus notes. It’s vibrant on the palate with racy acidity, edgy minerality, tart apple-citrus and lemon drop flavours. A well-balanced and delicious Gris. Rosehall Run Cuvee County Chardonnay 2010 ($22, fall release, Vintages TBA, 90 points) — The Cuvee County Chard goes right to the heart of Rosehall’s portfolio. The wine is aged in 500 L French oak puncheons, about a third of it new wood. The vintage was hot throughout Ontario but an earlier pick helped retain some juicy acidity. The flinty minerality is what hits you first on the nose, then toasted vanilla followed by pear and apple fruit with a touch of brioche. The pear-apple fruit is mouth-watering on the palate with lovely minerality and a hint of citrus on the finish. Excellent Chard. Rosehall Run Cuvee County Pinot Noir 2010 ($25, fall release, LCBO TBA, 89 points) — A late frost in the hot 2010 vintage cut yields about a third, with a paltry 1.2 tonnes per acre harvested. The resulting wine is a slightly different Pinot than what we are used to from Rosehall. The nose shows cherry fruit, underbrush, cedar, spice and charred-toasty oak aromas. It’s quite ripe in the mouth, soft in fact, with dark cherry, raspberry, earth and a rich vein of minerality to go with ripe tannins through the finish. It is delightful to see Norfolk County (South Coast) wines in the upper 80-point range. Relatively speaking, they have achieved so much in such little time. The wineries in the region are creating a trademark for the region using the grape drying process (appassimento), just like the farmers used to dry tobacco in the old tobacco industry there. Cold climate winemaking meets Italian dehydration grape preparation. What fantastic results! As a new member of the Norfolk community, and now grape grower in the region, I’m looking forward to what the future holds here.